The intricate art and careful craft of an illumination is reflected in this versatile jacket. 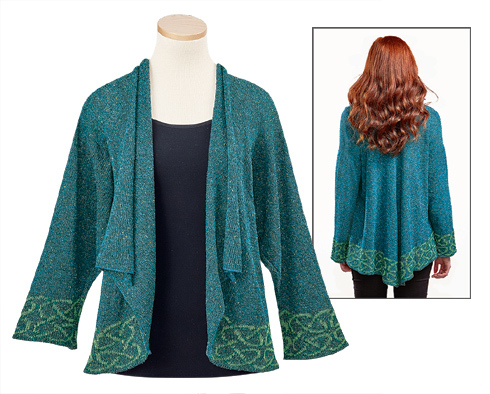 Knit-in Celtic knotwork trim highlights the hem and cuffs. Color-flecked yarns of silk, linen and cotton bring a rustic yet sophisticated air with subtle luster. Bias cut for fluid drape with no fasteners - wear open or with a pin. Cuffs can be folded back to reveal reverse pattern. Curved hem. 29" long in back. Midweight silk/linen/cotton; handwash. One size. Handcrafted in Scotland. Very pretty and wonderful quality. Warm without being heavy. It doesn't fit quite like it does on the model though! Not as long as I had expected. But still very nice.